Norwich never disappoints, so on with the waterproofs, and look for something we’d not done before – which today was Dragon Hall. Now approached via a fairly nondescript residential and commercial street, this was a thriving trading area in the Middle Ages, situated beside riverside wharfs. The hall was ‘lost’ for many years after being divided into a terrace of houses, but was thankfully rediscovered rather than redeveloped in the late 1970s, and after urgent work to preserve the decaying structure in the 1980s, and full restoration in 2005/6, the hall has been restored to its former glory. Unusually, the whole merchant hall was owned and operated by a single merchant (as opposed to a guild, as was normally the way) as a sign of his prosperity and financial security, in order to reassure trading partners. 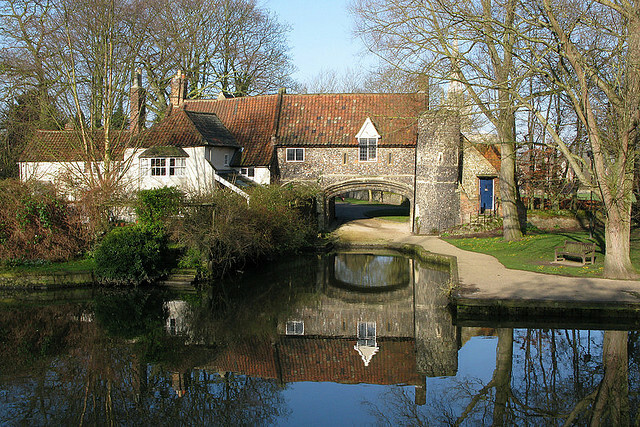 This was global import/export 1420s style, at a time when Norwich was the second city of England. 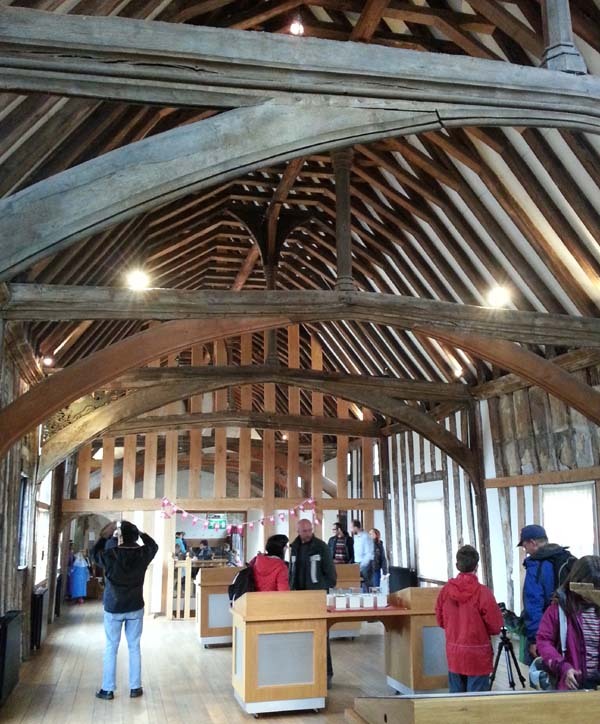 The hall is now open as a museum telling the story of Robert Toppes, the merchant who built the hall almost 600 years ago, as well as the story of the restoration of the hall. 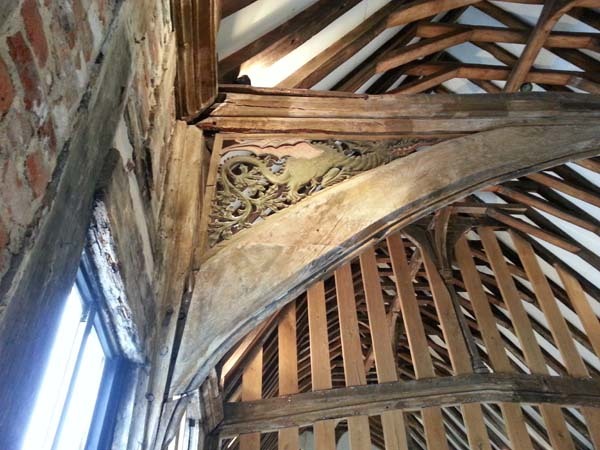 Oh, and in case you were wondering, it’s called Dragon Hall because of the dragon motifs uncovered in the roof beams during the 1970s survey, which were in turn inspired by the Norwich Snapdragon, a much-loved emblem of the city in the Middle Ages (see the Castle Museum for more information). As we left Dragon Hall, the weather was brightening up, so we crossed the river by the pedestrian footbridge, walked through the new cinema and retail complex on the other side, before crossing once again into the cathedral grounds by Pulls Ferry. From the early 16th century until 1943, a ferry river crossing operated here, and until around 1820 when the bridge was built, it was the main river crossing in this part of the city. The name ‘Pulls’ comes from the ferry operator from 1796 to 1841. The 15th century arch is believed to have been the entrance to a private canal, which was used to carry the stone for the construction of the cathedral. The stone was shipped from France, and the canal was used to link the short distance from the river to the cathedral site. The arch, which has a small room over the top, is now the regional headquarters of the Girl Guides, but also opens as a tea room on weekend afternoons through the summer, offering tea and a cake for a very reasonable £1.50 for Girl Guide funds. This entry was posted in In The Area on September 30, 2013 by Dave.